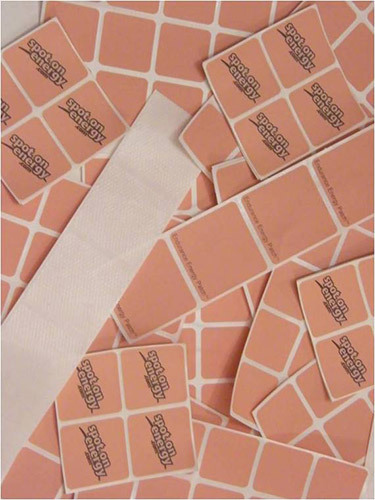 Pocono Coated Products is a leading supplier of cGMP-compliant transdermal patches for mass market consumption. Developed in the 1970’s for commercial use, transdermal patches provide an easy and convenient method of supplement transmission. Able to manufacture with unsurpassed flexibility, Pocono Coated Products can deliver large volumes of patches for many different herbal, vitamin, and synthetics applications. Available patch varieties include energy, stress, libido, sleep, and vitamin supplements, as well as bug repellant, medicinal, and dietary patches. Patches are made in-house using coating, slitting, printing, and packaging processes in a quality controlled manufacturing environment. Base material is a plastic polyolefin film with acrylic polymer adhesive. Flexo printed and thermochromic finishes are also available. Patches may be cut 1.25" to 14.5" wide, with complete orders distributed in sheet or roll form. Thanks to intensive quality inspection at every level of the creation process, Pocono Coated Products is able to provide safe and effective transdermal patches according to exact customer requirements. Large to small orders are possible on lead times of two to four weeks. Additional fulfillment, logistical, and designs services may be added to any order. See the table below for more service info, and contact Pocono Coated Products today to start a discussion about our transdermal patch capability.